I have an awful lot of watches, and most of them are chunky, men’s style watches; I own very few pretty watches. So when British watch designers Olivia Burton got in touch to see if I might like to review any of their designs, I seized the opportunity to have a delicate timepiece for the summer. 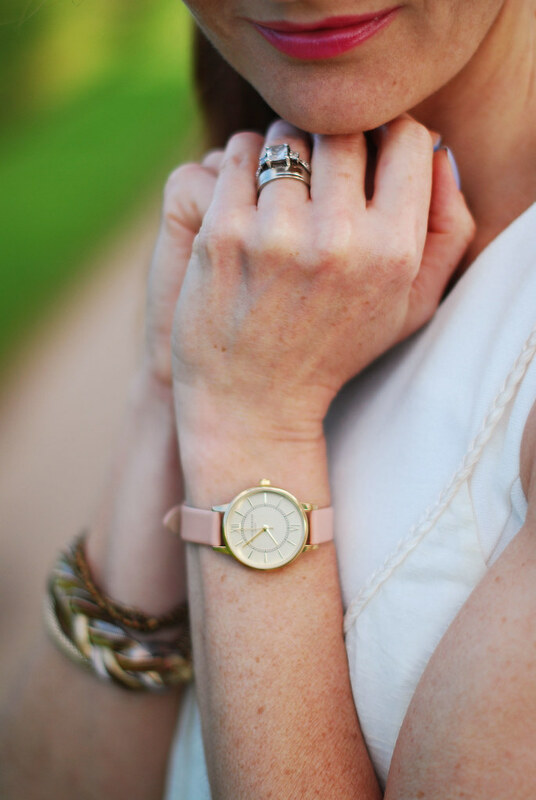 I chose the Wonderland Dusky Pink and Gold watch – the strap is real leather and a beautiful soft pink, and the face has Roman numerals: they always make a watch look more elegant in my opinion… it has to be the prettiest watch I own. 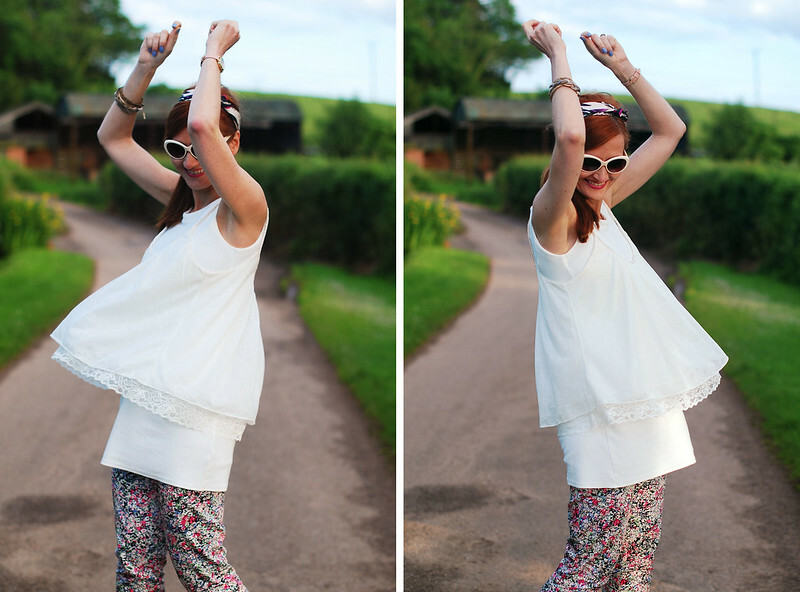 Such a lovely piece deserved lots of feminine touches in my outfit: a lace tank layered with a short white dress (last seen worn as a skirt here) over my Laura Ashley floral trousers and strappy bow sandals from last year. 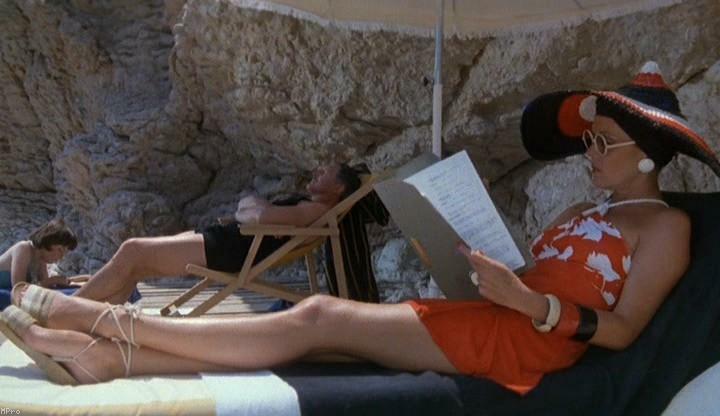 The combination of a silk headscarf and off white sunglasses gave the outfit that 1930s Riviera look – I was thinking Diana Rigg in Evil Under the Sun (I loved Agatha Christie films as a kid and thought she looked amazing in that one). Give them all a bit of a twirl to show off those layers – job done! Do you ever channel a look from an old movie now and then: what touches do you find give an outfit a certain “look” from a particular era? And are you a fan of pretty, delicate watches or chunky masculine ones? Do share in the comments! 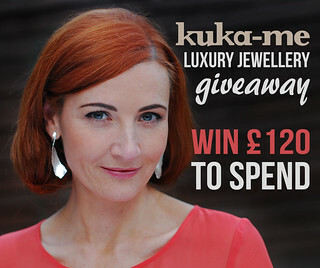 Don’t forget you can still enter my giveaway – win £120 to spend on jewellery at kuka-me.com! 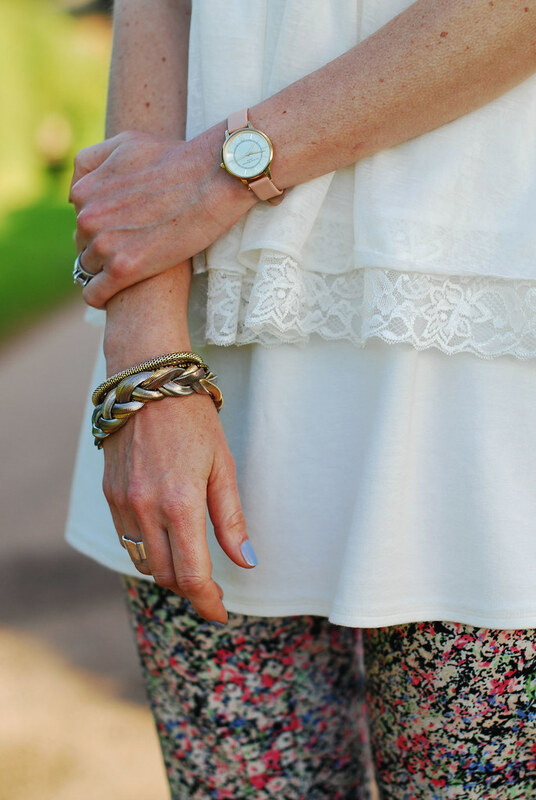 Really love this look-your floral pants are so pretty! Such a fun photo shoot! Wow – love this look on you. Every piece is beautiful! I actually only own one (working) watch, dear Catherine…and it happens to be a chunky, chain-bracelet version!! I wear it frequently on my blog, and I think it goes well with most of my looks (I especially like it stacked with other bracelets!!) 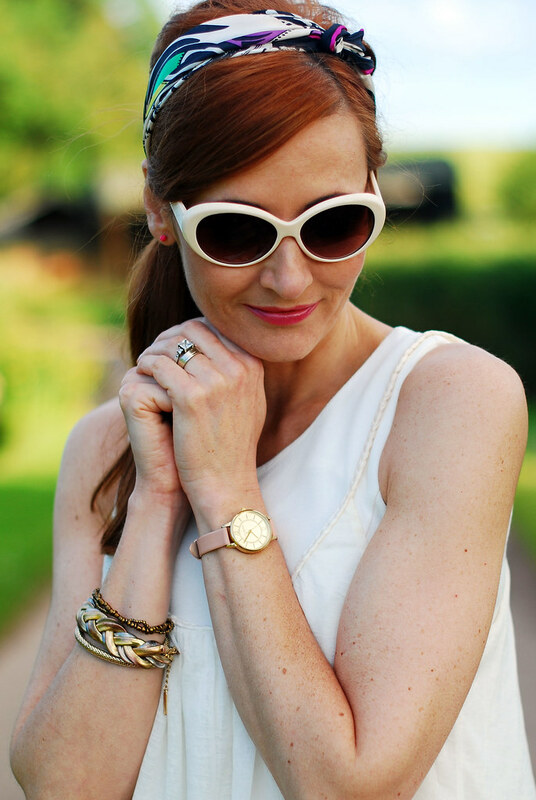 I almost never wear gold myself, but the gold and soft pink of your new arm candy is undeniably pretty…and the headband and sunnies are super-cute with your white and floral look!! I am loving your style and blog ,and looking forward to future posts. Thanks for showing that 40 some thing women still can look hot, have great style, and still just want to have fun! That is indeed a pretty watch. I usually go for pretty watches or classic watches. But I do own two chunky ones. They both were a gift haha, but I do like them a lot. Your outfit is great. I will copy the look of layering. I have a few things that might work when I layer it. And no, I don't have a clue what gives an outfit a certain look. I am terrible in styling. But slowly getting a teeny bit better. Will never be great, but…. Babysteps. Ah, so fresh and pretty!!! You look so pretty. I love that flouncy top and that pretty, pretty watch. Wonderful look on you. 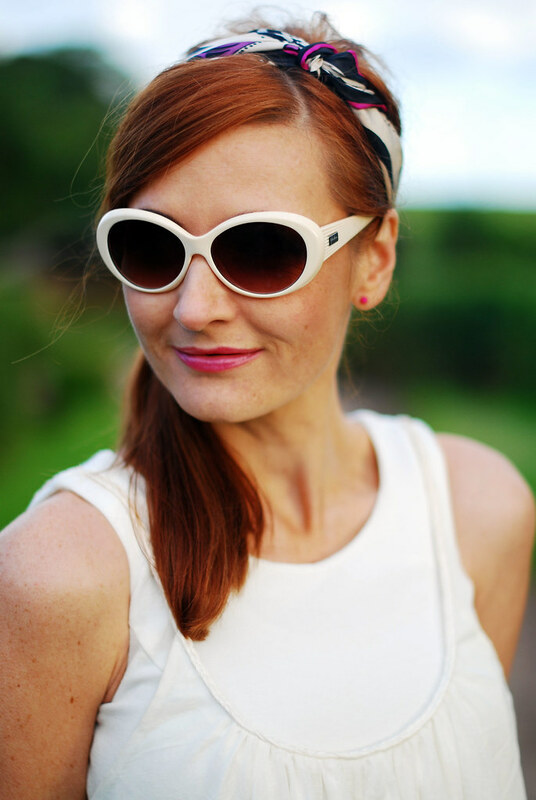 I love the white sunnies and the layered tops! Thanks for sharing with Visible Monday, xox. ooo that is such a pretty watch. I only own one watch but have been on the look out for a new one. This one sure is a beauty. the perfect feminine watch i'd say.